Tickets are now on sale for the must attend event of the year! 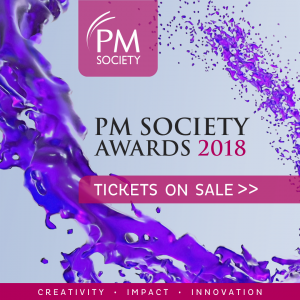 The PM Society Awards continues to be the biggest and best event celebrating creativity and innovation within the healthcare industry. Join us at the glittering lunchtime ceremony at the Grosvenor House on Friday 1st February 2019, when our celebrity host will reveal the winners and runners up of the industry’s longest running healthcare awards. This year will include a new award for “Innovation’’ as well as our new combined award for “Mixed Media’’. Following on from the ceremony you will have the opportunity to view the exhibition of work from entering agencies, network with peers, clients, partners and friends with a full bar and musical entertainment. The PM Society are delighted to be supporting the charity Team Essie for Chestnut Tree House at the event and you can find out more about their work here. Please contact the PM Society office on 01403 264 898 should you have any questions. We look forward to welcoming you and your guests on the 1st February 2019!